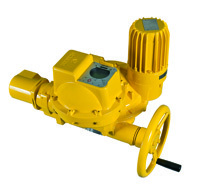 x-matic actuators are high end valve actuators with the features of the i-matic range in flameproof enclosure. Operation is made via graphic LCD and push buttons. The actuators comprise the same functions as c-matic actuators. They are further equipped with local and remote configurable actuator functions, self-monitoring, electronic name plate, operation data logging as well as diagnostic functions for preventive maintenance. short-time duty S2 - max. 15 min.